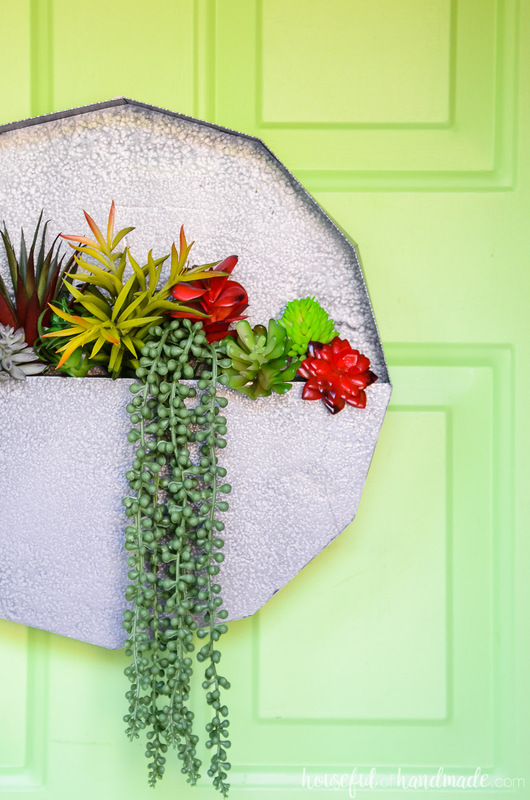 Add style to your home or front door with this easy succulent wall planter craft. 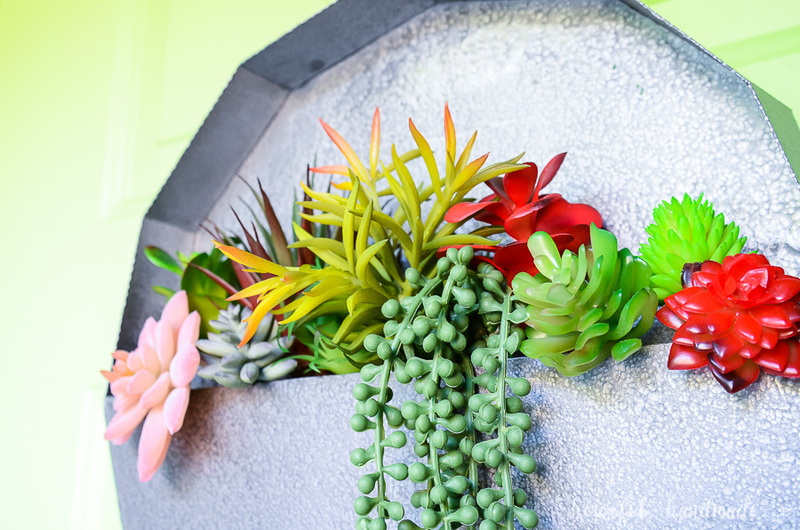 This quick succulent wall art is the perfect way to show off your favorite greenery. It has been way too long since I made a new wreath for my front door. Usually I am eager to make a new wreath every other month as the seasons start to change. So I was really itching to make a new wreath for the end of summer. I have been loving all the cool metal succulent wall planters I have seen and thought it would be the perfect wreath for my front door. The only problem… I do not have the tools needed to work with metal. Of course a little problem like no metal tools will not keep me from creating a beautiful succulent wall planter! Instead of using metal to make a beautiful wall vase for my succulents, I decided to use some of my favorite tricks. This wall planter is made out of paper! Yep, paper. But it looks just like metal and is perfect for some faux succulents (and then I don’t have to worry about accidentally killing them too). 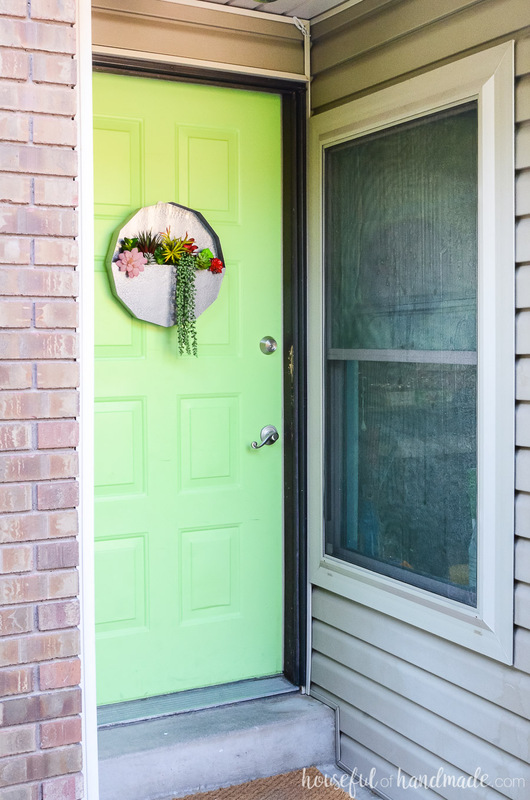 I love making unique wreaths for our front door. 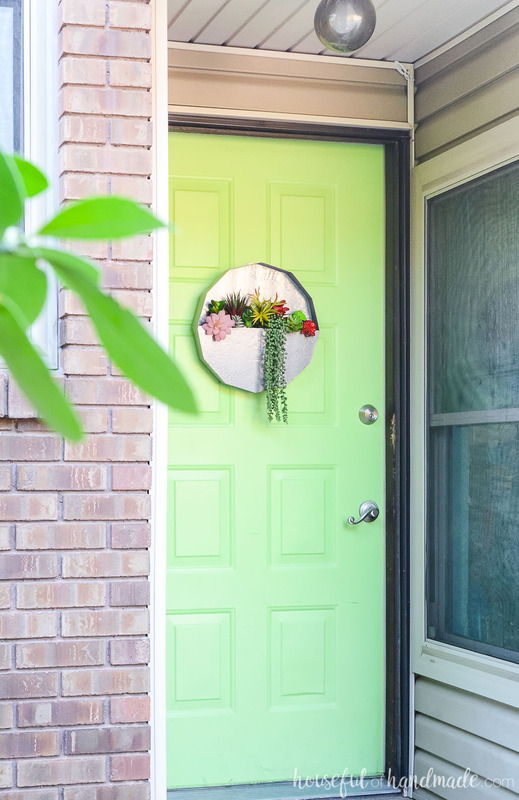 Big beautiful floral wreaths are fun, but something new that no one has seen is the perfect conversation starter for anyone that comes to visit. This metal succulent wall planter definitely falls into that category. And everyone wants to know if the succulents are real! 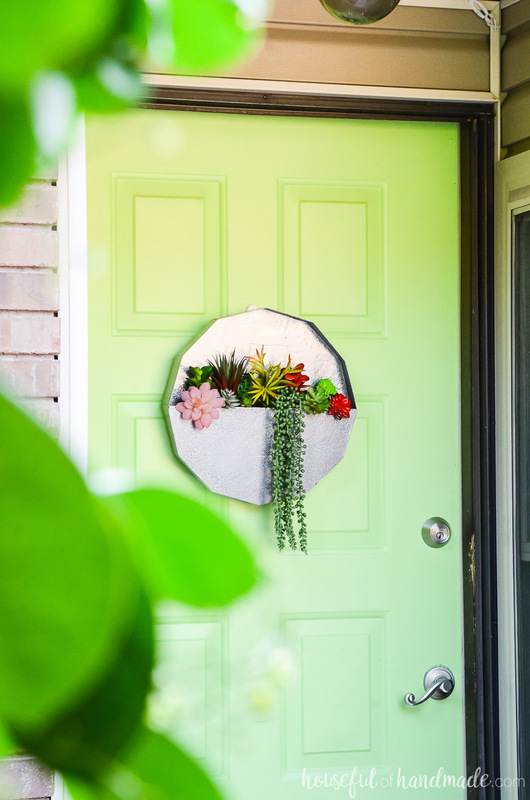 Even thought this wall planter is made out of paper and not metal, it is still super sturdy. I used all my tricks to make this fun craft last forever. Okay, maybe not forever, but I do have many fun paper home decor pieces that have lasted for years (this Anthropologie knock-off mirror is one of my favs and still looks like new after 2 years). I love to buy foam board at the dollar store. I am sharing the printable template (in PDF, SVG & DXF) in my subscriber library. Click here to subscribe to my weekly newsletter and gain access to all the freebies. If you already have your password, click here to download them. 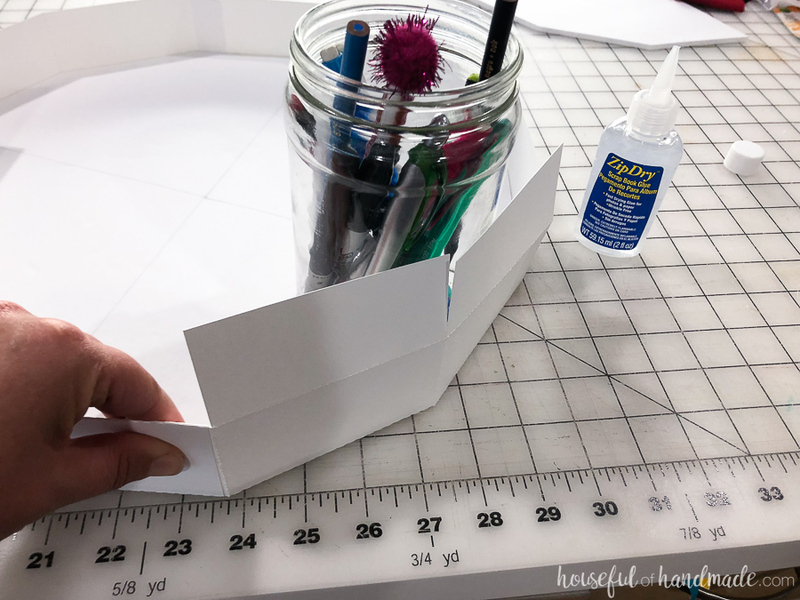 Typically I use hot glue for my paper crafts because it is quick. But sometimes the glue can Harden too quick. The ZipDry is still quite quick, but does allow time for you to reposition and doesn’t leave any extra bulk like hot glue can. I used Rustoleum Antique Pewter for my wall planter. 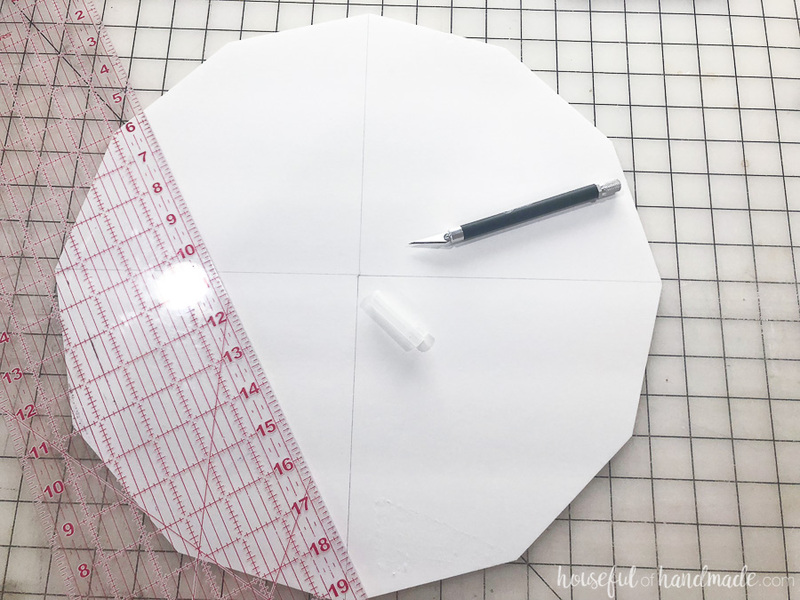 Start by printing out the templates or cutting them out with an electronic cutting machine (I love my Silhouette Cameo and use it ALL THE TIME!). 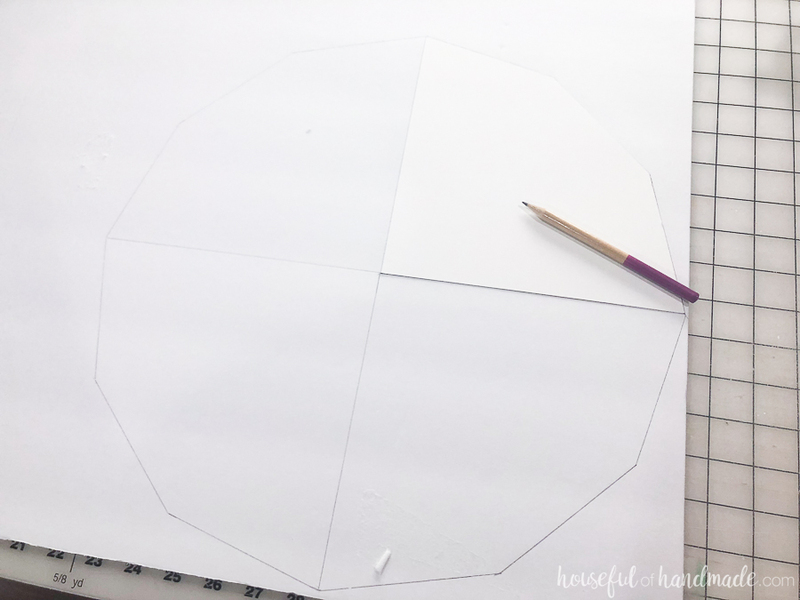 Trace the back template 4 times onto the piece of foam board so the center sides touch. And trace the temple 2 times onto the piece of foam board so you have half a circle. Use a very sharp or mechanical pencil to make sure the line is close to the template edge. 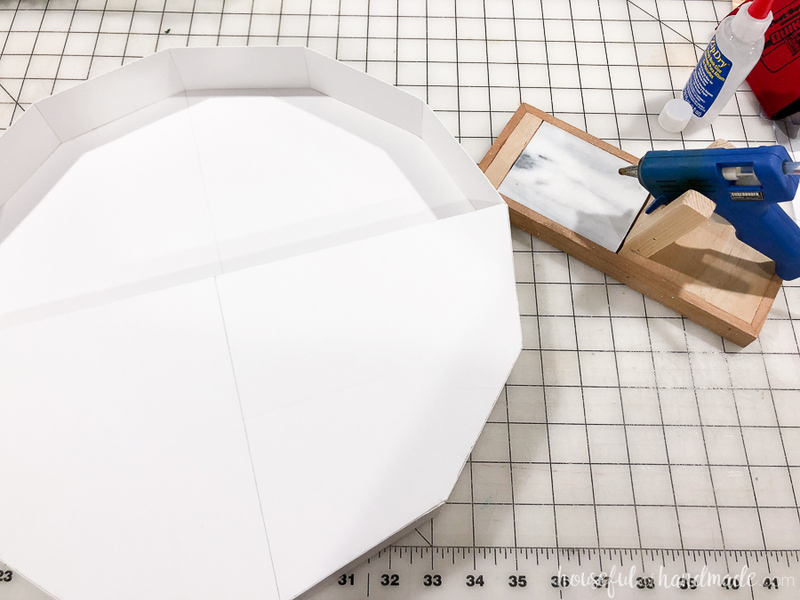 Using a sharp x-acto knife and a ruler, cut out the two pieces. 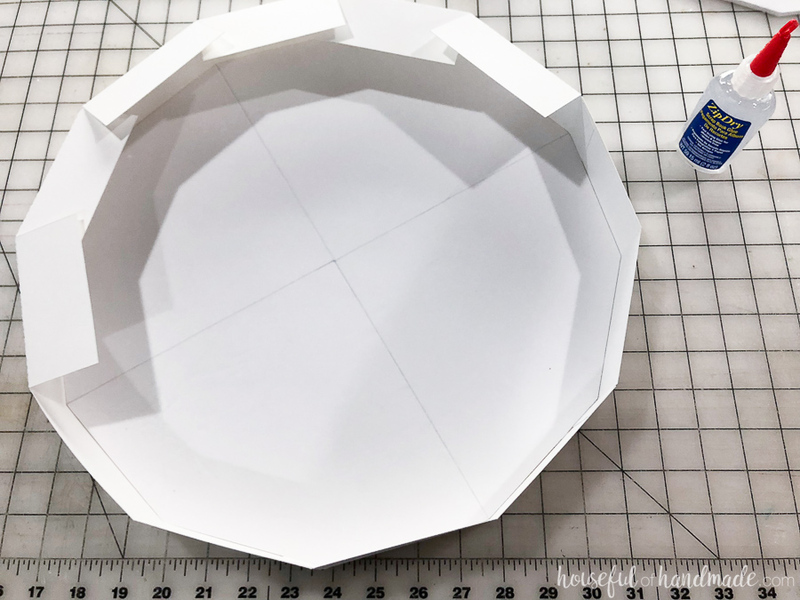 Before glueing on the side pieces, fold them cleanly along the dotted lines. Apply glue to the small flap of one of the pieces and glue it to the back of the foam board backing. Make sure the side fits snuggly against the foam board piece and snug into the corner. Once dry, move onto the next side piece. On the second side piece you will also want to glue the flap to secure the two sides together. Make sure the side is inside the circle (it will be hidden later). Glue all the sides so the sides with a extra large flap are on the top and the sides without are on the bottom. 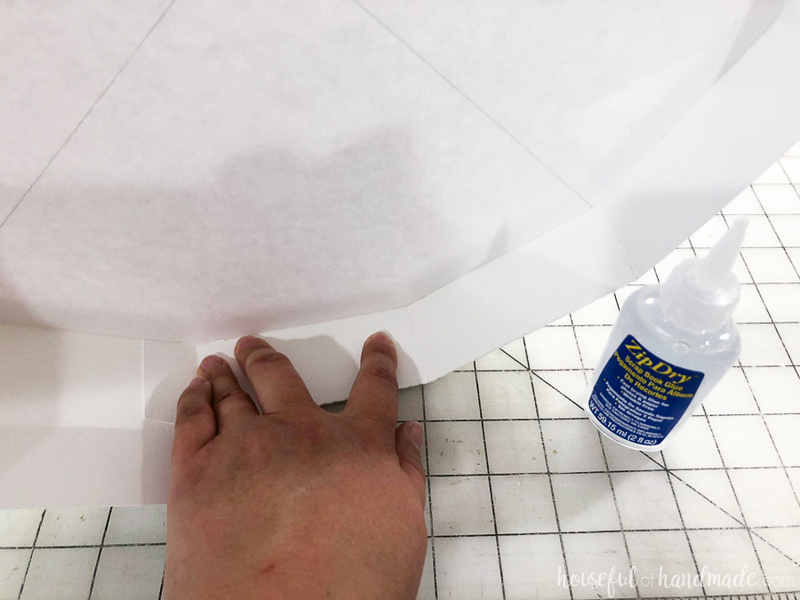 Add glue to the inside of the large flap and fold them into the side pieces so they add some extra structure to the top of the succulent wall planter and covers the flaps. Using the hot glue, attach the smaller piece of foam board into the bottom of the wall planter. It will cover all the side pieces that do not have the extra flap. Spray paint the entire planter with the hammered metal spray paint. 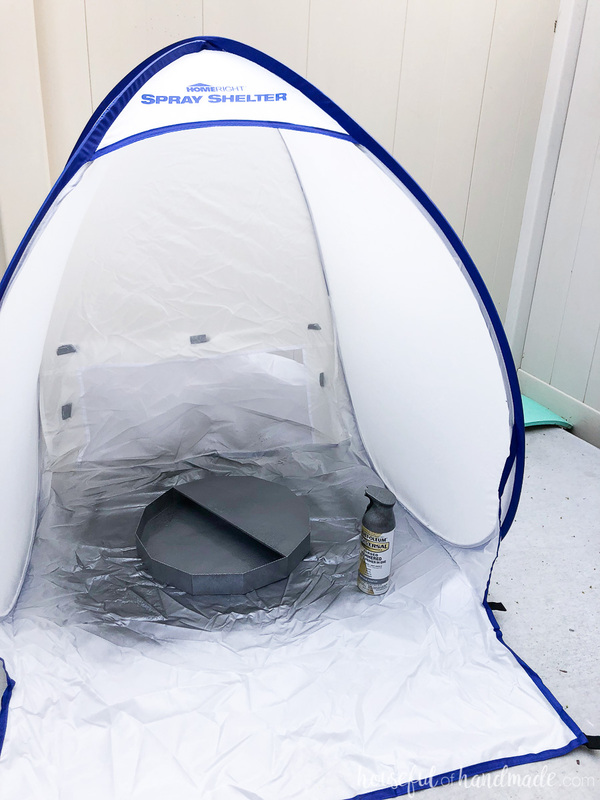 I love using my HomeRight small spray shelter for spray paint jobs (and it protects the rest of my patio from lots of spray paint overspray). 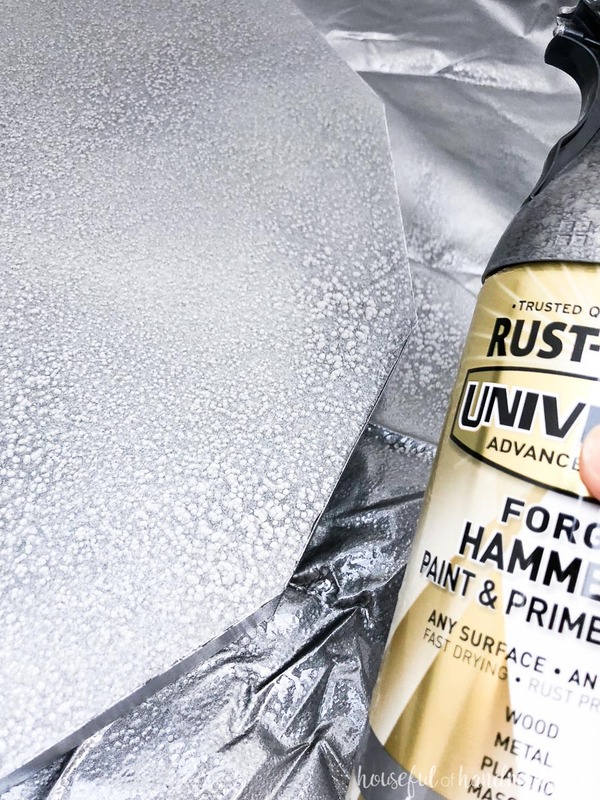 For the hammered metal, you need to get the spray paint a little thicker than normal paint. That is what allows it to make the cool hammered texture. Just start with a lighter coat and add on until it looks amazing! Hot glue a piece of 1″ ribbon to the back of the wreath to hang it. 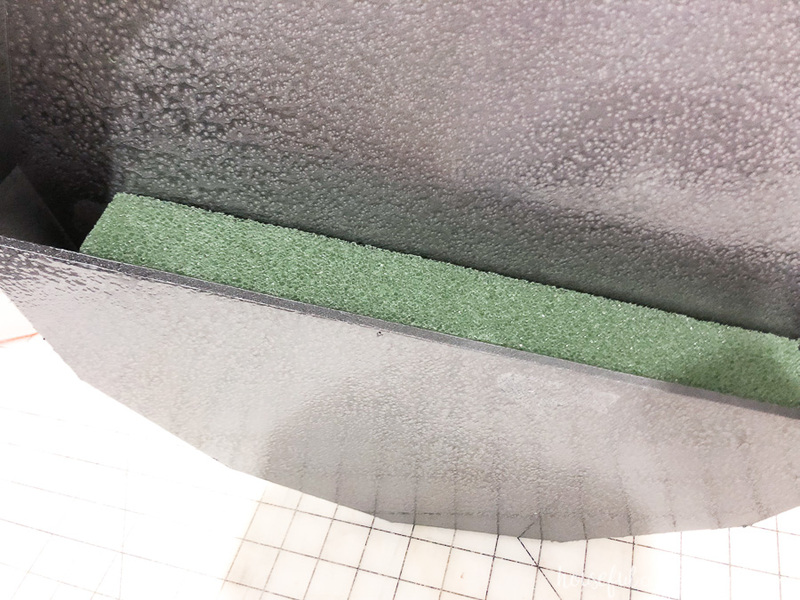 Trim the floral foam to fit inside the wall planter. Then stick your faux succulents into the foam to hold them in place. 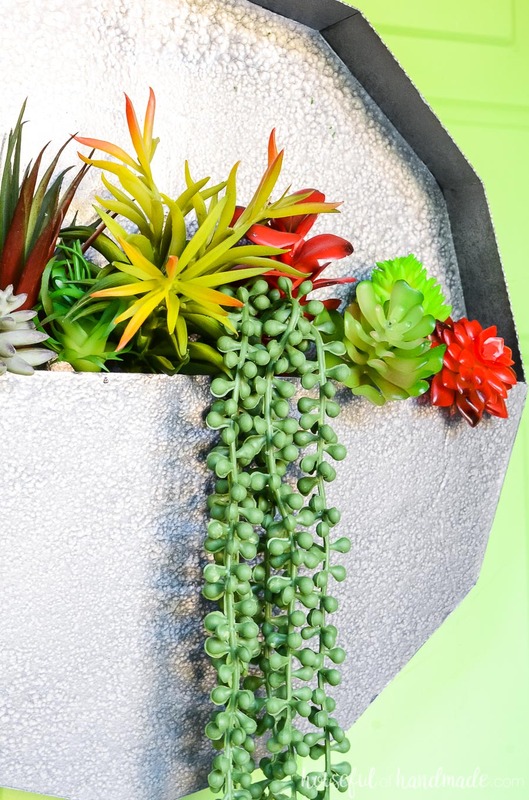 Move things around until you have the perfect arrangement of succulents in your new “metal” wall planter. All that was left was to hang it up. 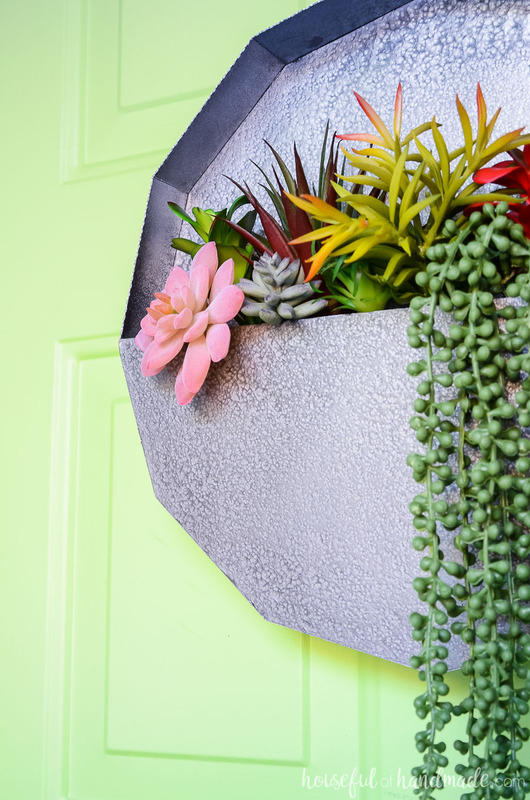 It looks great on our front door, but this easy succulent wall planter would be awesome anywhere in your home you want to add some greenery. Just imagine how cute a cluster of 3 would be! And I promise no one will guess your new succulent wall planter is made out of paper and filled with fake plants!